nothing is so heartbreaking as unemployment. America was served a September Jobs Report which best can be described as a Phoney Baloney Sammich. Every article I read today on the September Unemployment statistics (and there were many) complained of murky numbers served with a side of statistics that made no sense. Not just to me but many Economists and Business Editorials had trouble with the formulation of the BLS numbers. To help all of us understand the U3 and U6 numbers used by the Bureau of Labor & Statistics I found this information from The Brenner Brief, very helpful: "The U6 unemployment rate counts not only people with out work seeking full-time employment, (the more familiar U-3 rate), but also counts 'marginally attached workers and those working part-time for economic reasons." Note that some of these part=time workers counted as U-3 could be working as little as an hour a week. And the 'marginally attached workers' included those who have gotten discouraged and stopped looking, but still want to work. The age considered for this calculation is 16 years and over. The U6 numbers are the meaningful numbers. They take into account the people who are no longer actively looking for work because they have been unemployed so long that they have given up their search. The U3 number of 7.8% excludes those who have given up looking, and counts someone who is part-time as being employed. 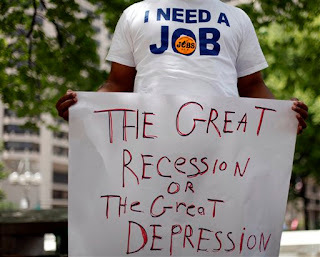 They are not an accurate portrayal of the employment situation in this nation under President Barack Obama"
The U-3 story portrayed by the September Jobs Report as based on all of the articles I have read today is more than a rotten fish sandwich with too much tartar sauce. During June July and August our leviathan Federal Government slipped an astounding 65,000 jobs to add to each of our tax burdens. I could not find a resource to identify the guilty Agencies and Bureaus. Breitbart Big Government goes on to say: "The total number of jobs added in September was 114,000, according to the BLS--well below the monthly average in recent years, and far below the July Jobs increase, which had been described as good. Economist had predicted a rise of 111,000 to 114,000 jobs--but that rise would have meant a rise in the unemployment rate from 8.1% to 8.2% Update:given long-term labor force trends). With the large revisions from the BLS--revising private sector jobs down, and public sector jobs up--the September jobs coincided with an unusually dramatic drop in the unemployment rate, causing some experts to greet the new numbers with puzzlement. Government jobs are an important part o the explanation." I will readily admit that when I read the Breitbart article this morning my head nearly exploded. Our deficit this year was officially 1.1 Trillion dollars, and the Obama Administration hired people and we are borrowing money from the Chinese to pay their wages. I would like to also add that it is really difficult to terminate Civil Service employees. So you and I will be stuck with 65,000 more paychecks to unknown federal employees for possibly as long as 30 years. Peter Morici. That means GDP growth must be running at a 4% to 5% pace, not the 1.3% rate it is running at now, a pace that has been trending downhill since last year. In September 2012, there were 6.73 million people who say they currently want a job, but are not looking for work says Farrell, If all 6.727 million of these workers suddenly started looking for a job, and would in turn be counted in the workforce and as unemployed then the unemployment rate would rise to 11.63%"
By some magic that went completely unreported during all of September 800,000 unemployed Americans supposedly became self-employed. The biggest jump in job creation since 1983. Anecdotally one of my followers on Twitter says that Mark Levin said today that the Department of Labor question is, "Do you sell things from home?" And many respondents may have answered yes as they sell their belongings to make ends meet and survive. Which may explain how the numbers from BLS were so spectacular. This makes sense of the statistics found in phone surveys by The Department of Labor. It could well be that the manipulative question is likely responsible for the insanely high number of invisible new jobs from nowhere that makes no sense in any other snapshot of real hard statistical verifiable facts. The U-6 Unemployment rate remains unchanged at 14.7 percent. We need 120,000 to 150,000 jobs just to keep up with the population. In this article from The Washington Examiner: "BLS explains that, "The number of person employed part time for economic reasons (sometimes referred to as involuntary part-time workers) rose from 8.0 million in August to 8.6 million in September. These individuals were working part time because their hours had been cut back or because they were unable to find a full-time job." This is why a broader measure of unemployment, which takes into account those who were forced to accept inferior jobs remained flat at 14.7%." "This report is a tale of two labor markets. The establishment survey (payrolls) painted a picture of moderately growing employment over the last three months but a a marginally slower pace than over the last year. At this pace of job creation the unemployment rate should be barely drifting lower given underlying demographic trends. In contrast, the household survey painted a picture of a sharply falling unemployment rate-down 1.2% over the last 12 months. Such a rapid decline in the unemployment rate over the last two months is a statistical quirk (the household data show an increase in employment of 872,000 in September, which is completely implausible and likely a result o sampling volatility). Moreover, declining labor force participation over the last year (resulting in 1.1 million people disappearing from the labor force) accounts for much of the rest of the decline. With this report, the ISMs, and vehicle sales the September economy is off to a better than expected start but nowhere near as good as suggested by the decline in the unemployment rate." "Of course the economy is not growing at 4-5% not even half that. 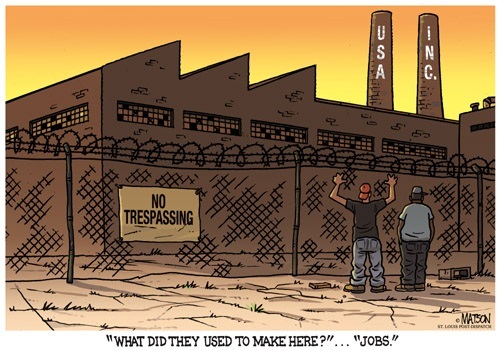 This is a jobs recovery built on part-time jobs, falling wages and disappeared discourage workers. As JPMorgan's econ team noted: "The one asterisk to the good news from the household survey was the apparent low quality composition of the jobs created, as there was a surge in people working part time for economic reasons, a development which left the widely followed U-6 measure of underemployment unchanged at 14.7%." 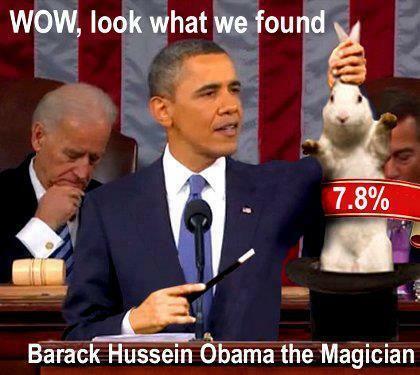 Our GDP is at 1.3%. Based on the above quote from RFQ Economics shows that our nation's economic engine is not healthy enough to generate that many jobs. This article "Moore Proof The U.S. Economy Is Falling Apart: GDP Revision A Grim Sur"
from Forbes Magazine list some really bad news about the growth of our economy. The article says that the decline in spending and investment are a drag on our economy. They report durable goods orders (a measure of factory activity) cratered last month and that the Commerce Department reported that orders fell by 13.9% Transportation dropped by 35%. We are in deep trouble right here at River City Cafe. It is clearly impossible to have the job growth suggested by Hilda Solis the Department of Labor and Bureau of Labor statistics with a GDP that is in ICU with a death rattle. Businesses fear the coming fiscal cliff, and sequestration will really damage high paying jobs in the defense industry. And too boot your BLS BS sammich was made in a dirty kitchen with cooks who may or may not have washed their hands. As if the bizarre September 'quirky' numbers are not bad enough, this should melt your milkshake. At least two of the economists at the Bureau of Labor and Statistics have donated to the Obama Campaign. One of the men worked on examining the impact of Obamacare. As for this voter I am ordering new leadership for dessert. I have had enough of the Obama Administration's Blue Plate Specials. Spot-on article Melody-I can see you did a lot of great research for it. It is simply mind boggling how far this Regime and its enablers will go to create a favorable sound bite (Hooray, it's Under 8%! ), just to help prop up Obama. I wonder if that manipulative/suggestive BLS question "Do you sell things from home?" was asked for the first time last month? If so, that means the additional "part timers" were not new jobs in September, but built up over many previous months. These BLS & Regime corruptocrats need to be broomed in November, along with King Barry Saetoro.